This is my good friend and fellow CCEA member Ridgeview Alt Ed principal Mike Lerch. 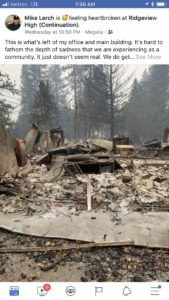 His school was completely destroyed by the devastating Camp Fire in Paradise. He had recently submitted his application for a model school and now is in complete rebuild mode. Most of the attention as always goes to the high school, but Ridgeview has been completely lost and I was hoping the CCEA would like to know about one of their own. Read Principal Mike Lerch’s post on Facebook by clicking the pic to enlarge it. On behalf of our CCEA’s officers, reps and members, we’d like to express our condolences and support to the staff, students, teachers, and the community affected by this tragedy. We’ve already started putting the word out on social media about how you can support them. 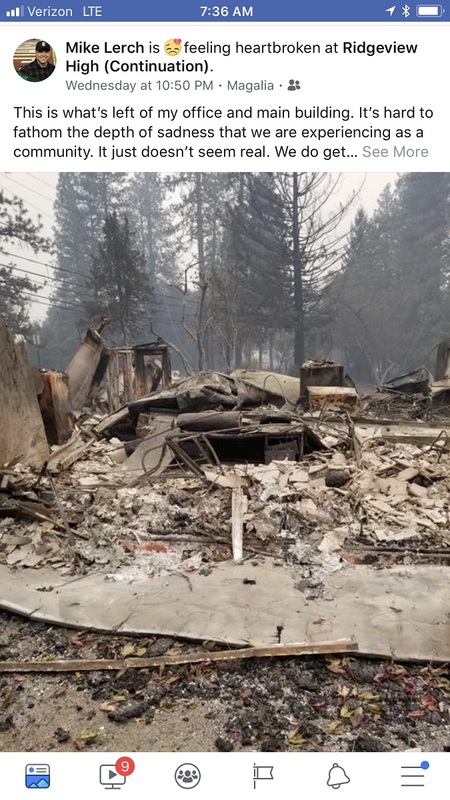 The goal for #AltEd students from Ridgeview High School (Continuation HS) and Honey Run Academy (Community Day) destroyed in the #CampFire will be resuming school on December 3rd. They are developing a home base for the students, and it cannot be in Paradise as most of the town is still evacuated and there is frankly little or no infrastructure remaining, along with dangerous conditions still. The CCEA would like to encourage students from around the state send letters of support to the students who have lost their schools and in most cases their homes. Please help us spread the word. Gift Cards or Gas Cards to be given to students can also be sent to the above address as well. 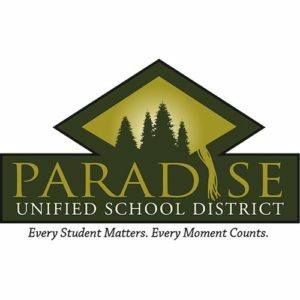 If you have specific questions about needs you can email Stacy Pew a staff member from Paradise Unified who is going to be the contact for Honey Run Academy and Ridgeview High School donations. Her email is: spew (at) pusdk12 (dot) org. Let’s support our #AltEd colleagues & students. Please help spread through social media & any contacts you have. They deserve #AltEd champions during this disaster. We’ll be posting other ways you can support Ridgeview on Twitter and Instragram. Please share donation links and updates with us here.